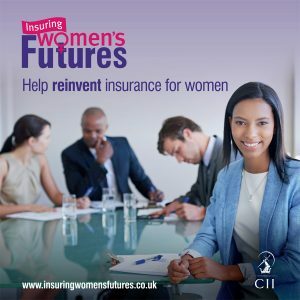 Insuring Women’s Futures (IWF) is a programme established by the Chartered Insurance Institute (CII), aimed at promoting and enhancing the insurance industry’s role in relation to women and risk. The UK insurance industry alone contributes £29bn to GDP and employs 334,000 people. It plays a vital socio-economic role in relation to the women’s risk agenda, both as a provider of insurance risk solutions, and as an employer harnessing female talent, alongside lending support to women through a range of social responsibility activity. IWF is established in the knowledge that there is more to do to promote women in the insurance industry, both as clients and as employees. IWF is formed as a platform to support firms and individuals from within and outside the industry to engage in change on this important topic. To read more please download the PDF document here.